Remember when Will Smith ruled the 90’s? ‘Independence Day’, ‘Men In Black’ and ‘Bad Boys’? And of course his iconic TV show ‘The Fresh Prince Of Bell-Air’. He was the the biggest movie star to emerge through that decade. 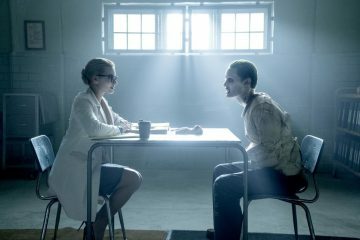 These days, he does less, but the magic is still there, proven by ‘Suicide Squad’ and ‘Men In Black III’. 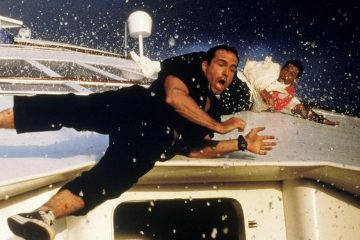 But during the 90’s, there was another smash hit action thriller under Smith’s belt. The absolutely fantastic ‘Enemy Of The State’. Produced by legendary action movie producer Jerry Bruckheimer, and directed by the wonderful and sadly missed Tony Scott, ‘Enemy Of The State’ centers on Robert Clayton Dean (Will Smith), a lawyer who unwittingly becomes embroiled in a murderous political scandal in Washington DC. With evidence of the murder of a congressman trust upon him by a terrified witness who winds up dead, Dean is now the target of a highly advanced team, controlled by NSA’s Thomas Reynolds, (Jon Voight) who have committed the crime to have a controversial national security program brought into action. With the lawyer now the suspect of murder, and his family’s lives at stake, he must fight to clear his name with the help of the mysterious “Brill”, played by Oscar winning legend Gene Hackman, while fleeing from the brutal kill squad who will stop at nothing to bring him down. 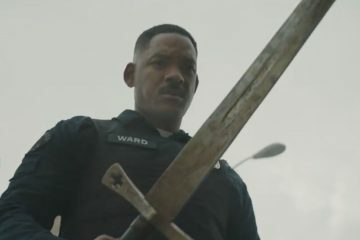 For all the great things Will Smith can do, the great acting range he has, he does nothing better than he does action. As ‘Bad Boys’ proved, (and later the magnificent ‘Bad Boys II’ and ‘I Robot’), Smith is at his best when running with guns and saving the day. And in ‘Enemy Of The State’, he’s every bit the beloved movie star we all know him to be. Armed with class, a fun sense of humour and a need to thrill the audience, he’s on incredible form here. And the rest of the cast do a superb job too. Especially Gene Hackman, who brings even more fun to the screen, with a panic-riddled and paranoid performance. Hackman always delivers. And having worked with Tony Scott and Jerry Bruckheimer before on the iconic ‘Crimson Tide’, he certainly delivers yet again. And also Jon Voight, another Oscar winning great, who serves up a vicious snarling performance as Reynolds, the movie’s number one villain. There’s no doubt all three stars played to type, but when their type is Hollywood perfection, who can deny their greatness here? Action movies are awesome. We know that. But vital ingredients must always be used. And among those is a perfect action movie score. And ‘Enemy Of The State’ certainly packs one of the greatest scores of its genre into in 145 minute runtime. With the awesome talents of Harry Gregson-Williams and Trevor Rabin once again combined, the score here plays a major role in the movie’s exciting chase scenes. The two legends work brilliantly together to bring a gorgeous almost futuristic sound to the action, while never overshadowing what’s on screen. 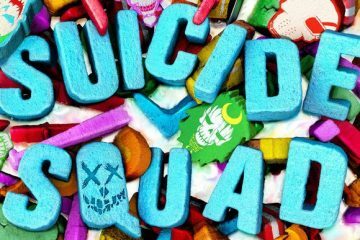 The soundtrack to this movie is a must in any library of movie music lovers. It’s certainly one of my favorites. The action here, while not overly bombastic, is handled incredibly, by the late great Tony Scott. 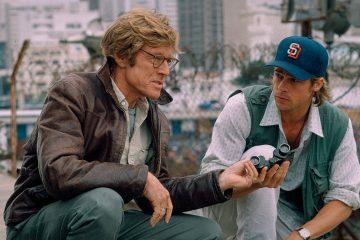 Having brought us some of the finest classic action movies we’ve ever seen, such as ‘Top Gun’, ‘Days Of Thunder’, ‘The Last Boy Scout’, ‘Crimson Tide’, ‘Beverly Hills Cop II’, ‘Man On Fire’ and my personal favorite, ‘Unstoppable’ Scott was a once-in-a-lifetime director with vision and style to rival almost anyone in Hollywood. And with ‘Enemy Of The State’, he brings his trademark frenetic camera work and pure love of thrillers to full limit. 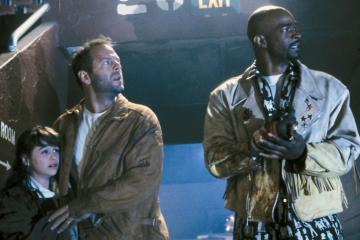 Fast, brutal and brimming with intensity, this movie is the perfect example of who Tony Scott was as a filmmaker. As a huge fan of action cinema, I recognize this great man as being the first of his kind. Without Tony, we wouldn’t have Michael Bay or Paul Greengrass, or any other filmmaker who uses the fast-paced circus thrills we have now, if not for him. May we forever tip our hats in respect. 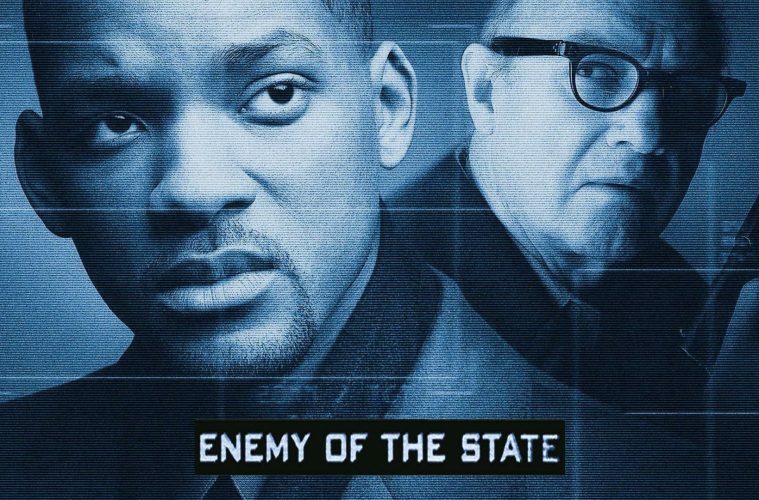 ‘Enemy Of The State’ is an action movie masterpiece. Fantastic story, three of Hollywood’s finest in the lead roles and a glorious director we’ll always remember with great love and affecton, very few movies have what this has to offer. If you’ve never seen it, it’s a must-own. Movies truly don’t come much better than this.